Bring the stock to the boil and add the potatoes. Simmer until just tender, now add the broccoli, cover and simmer until softened – don’t over cook, we want vibrant green broccoli. Use a slotted spoon and remove the veggies, place into a mixing bowl. Add the haddock to the remaining stock, add more liquid if necessary. Cover and poach for +- 10 minutes max or until the fish flakes apart. Drain fish in a colander and allow to cool slightly. Remove skin and any bones. Add fish to the mixing bowl. Use a fork or masher and mush everything together. Add the remaining fish cake ingredients (not the crumbing) and mix until well combined. With wet hands, form into 7-8 firm patties and then place in the fridge to chill for 15 minutes before crumbing. 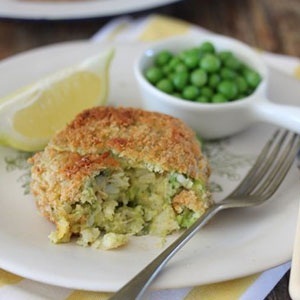 Dip chilled patties in seasoned flour, egg and then a generous coating of crumbs. Chill in the fridge for another 15 minutes for best results. Heat a pan of shallow oil (2 cm deep) and fry the patties until golden and heated through on the inside +- 6 minutes a side over moderate heat. Alternatively, just brown in oil until golden then transfer into a 180ºC oven and heat through for 12 minutes. Serve with petit pois and fresh lemon.